← Christ-Centered Expositional Commentary Series Coming in the Spring of 2013! Preacher: Do You Have A Theology of Preaching? “Preach the word!” That simple imperative frames the act of preaching as an act of obedience (see 2 Tim. 4:2, NIV). That is where any theology of preaching must begin. Preaching did not emerge from the church’s experimentation with communication techniques. The church does not preach because preaching is thought to be a good idea or an effective technique. The sermon has not earned its place in Christian worship by proving its utility in comparison with other means of communication or aspects of worship. Rather, we preach because we have been commanded to preach. Preaching is a commission—a charge. As Paul stated boldly, it is the task of the minister of the gospel to “preach the Word, … in season and out of season” (2 Tim. 4:2, NIV). Paul begins with the humble acknowledgment that preaching is not a human invention but a gracious creation of God and a central part of His revealed will for the church. Furthermore, preaching is distinctively Christian in its origin and practice. Other religions may include teaching, or even public speech and calls to prayer. However, the preaching act is sui generis, a function of the church established by Jesus Christ. As John A. Broadus stated: “Preaching is characteristic of Christianity. No other religion has made the regular and frequent assembling of groups of people, to hear religious instruction and exhortation, an integral part of divine worship” (John A. Broadus, On the Preparation and Delivery of Sermons, rev. Vernon L. Stanfield. San Francisco: Harper and Row, 1979, iv.). The importance of preaching is rooted in Scripture and revealed in the unfolding story of the church. The church has never been faithful when it has lacked fidelity in the pulpit. In the words of P. T. Forsyth: “With preaching Christianity stands or falls, because it is the declaration of the gospel” (P. T. Forsyth, Positive Preaching and the Modern Mind. Grand Rapids: Eerdmans, 1964, 5). The church cannot but preach lest it deny its own identity and abdicate its ordained purpose. Preaching is communication, but not mere communication. It is human speech, but much more than speech. As Ian Pitt-Watson notes, preaching is not even “a kind of speech communication that happens to be about God” (Ian Pitt-Watson, A Primer for Preachers. Grand Rapids: Baker Book House, 1986, 14). Its ground, its goal, and its glory are all located in the sovereign will of God. The act of preaching brings forth a combination of exposition, testimony, exhortation, and teaching. Still, preaching cannot be reduced to any of these, or even to the sum total of its individual parts combined. The primary Greek form of the word “preach” (kērusso) reveals its intrinsic rootage in the kerygma—the gospel itself. Preaching is an inescapably theological act, for the preacher dares to speak of God and, in a very real sense, for God. A theology of preaching should take trinitarian form, reflecting the very nature of the self-revealing God. In so doing, it bears witness to the God who speaks, the Son who saves, and the Spirit who illuminates. True preaching begins with this confession: we preach because God has spoken. That fundamental conviction is the fulcrum of the Christian faith and of Christian preaching. The Creator God of the universe, the omniscient, omnipotent, omnipresent Lord chose of His own sovereign will to reveal Himself to us. Supreme and complete in His holiness, needing in nothing and hidden from our view, God condescended to speak to us—even to reveal Himself to us. As Carl F. H. Henry suggests, revelation is “a divinely initiated activity, God’s free communication by which He alone turns His personal privacy into a deliberate disclosure of His reality” (Carl F. H. Henry, God, Revelation and Authority, Vol. 2. Waco: Word Books, 1976, 17). In an act of holy graciousness, God gave up His comprehensive privacy that we might know Him. God’s revelation is the radical claim upon which we dare to speak of God—He has spoken! Our God-talk must therefore begin and end with what God has spoken concerning Himself. Preaching is not the business of speculating about God’s nature, will, or ways, but is bearing witness to what God has spoken concerning Himself. Preaching does not consist of speculation but of exposition. The preacher dares to speak the Word of truth to a generation which rejects the very notion of objective, public truth. This is not rooted in the preacher’s arrogant claim to have discovered worldly wisdom or to have penetrated the secrets of the universe. To the contrary, the preacher dares to proclaim truth on the basis of God’s sovereign self-disclosure. God has spoken, and He has commanded us to speak of Him. The Bible bears witness to itself as the written Word of God. This springs from the fact that God has spoken. In the Old Testament alone, the phrases “the Lord said,” “the Lord spoke,” and “the word of the Lord came” appear at least 3,808 times (As cited in Martyn Lloyd-Jones, Authority. London: InterVarsity Press, 1958, 50). This confession brings the preacher face to face with Scripture as divine revelation. The authority of Scripture is none other than the authority of God Himself. As the Reformation formula testifies, “where Scripture speaks, God speaks.” The authority of the preacher is intrinsically rooted in the authority of the Bible as the church’s Book and the unblemished Word of God. Its total truthfulness is a witness to God’s own holiness. We speak because God has spoken, and because He has given us His Word. As Scripture itself records, God has called the church to speak of Him on the basis of His Word and deeds. All Christian preaching is biblical preaching. That formula is axiomatic. Those who preach from some other authority or text may speak with great effect and attractiveness, but they are preaching “another gospel,” and their words will betray them. Christian preaching is not an easy task. Those who are called to preach bear a heavy duty. As Martin Luther confessed “If I could come down with a good conscience, I would rather be stretched out on a wheel and carry stones than preach one sermon.” Speaking on the basis of what God has spoken is both arduous and glorious. A theology of preaching begins with the confession that the God who speaks has ultimate claim upon us. He who spoke a word and brought a world into being created us from the dust. God has chosen enlivened dust—and all creation—to bear testimony to His glory. In preaching, finite, frail, and fault-ridden human beings bear bold witness to the infinite, all-powerful, and perfect Lord. Such an endeavor would smack of unmitigated arrogance and over-reaching were it not for the fact that God Himself has set us to the task. In this light, preaching is not an act of arrogance, but of humility. True preaching is not an exhibition of the brilliance or intellect of the preacher, but an exposition of the wisdom and power of God. This is possible only when the preacher stands in submission to the text of Scripture. The issue of authority is inescapable. Either the preacher or the text will be the operant authority. A theology of preaching serves to remind those who preach of the danger of confusing our own authority with that of the biblical text. We are called, not only to preach, but to preach the Word. Acknowledging the God who speaks as Lord is to surrender the preaching event in an act of glad submission. Preaching thus becomes the occasion for the Word of the Lord to break forth anew. This occasion itself represents the divine initiative, for it is God Himself, and not the preacher, who controls His Word. John Calvin understood this truth when he affirmed that “The Word goeth out of the mouth of God in such a manner that it likewise goeth out of the mouth of men; for God does not speak openly from heaven but employs men as His instruments” (John Calvin, Commentary on Isaiah [55:11], Corpus Reformatorum 37.291, cited in Ronald S. Wallace, “The Preached Word as the Word of God,” in Readings in Calvin’s Theology, ed. Donald McKim. Grand Rapids: Baker Book House, 1984, 231). Calvin understood preaching to be the process by which God uses human instruments to speak what He Himself has spoken. This He accomplishes through the preaching of Scripture under the illumination and testimonium of the Holy Spirit. God uses preachers, Calvin offered, “rather than to thunder at us and drive us away” (John Calvin, Institutes of the Christian Religion, IV.1.5, tr. Floyd Lewis Battles, ed. John T. McNeill, 2 vols. Philadelphia: Westminster Press, 1960, 1018). Further, “it is a singular privilege that He deigns to consecrate to Himself the mouths and toungues [sic] of men in order that His voice may resound in them” (Ibid). Thus, preaching springs from the truth that God has spoken in word and deed and that He has chosen human vessels to bear witness to Himself and His gospel. We speak because we cannot be silent. We speak because God has spoken. “In the past,” wrote the author of Hebrews, “God spoke to our forefathers through the prophets at many times and in various ways, but in these last days He has spoken to us by His Son, whom He appointed heir of all things, and through whom He made the universe” (Heb. 1:1–2, NIV). The God who reveals Himself (Deus Revelatus) has spoken supremely and definitively through His Son. Carl F. H. Henry once stated that only a theology “abreast of divine invasion” could lay claim upon the church. The same holds true for a theology of preaching. All Christian preaching is unabashedly Christological. Christian preaching points to the incarnation of God in Christ as the stackpole of truth and the core of Christian confession. “God was in Christ, reconciling the world unto Himself” (2 Cor. 5:19). Thus, preaching is itself an act of grace, making clear God’s initiative toward us in Christ. Preaching is one means by which the redeemed bear witness to the Son who saves. That message of divine salvation, the unmerited act of God in Christ, is the criterion by which all preaching is to be judged. With this in mind, all preaching is understood to be rooted in the incarnation. As the apostle John declared, God spoke to us by means of His Son, the Word, and that Word was made flesh and dwelt among us (1:14). All human speech is rendered mute by the incarnate Word of God. Yet, at the same time, the incarnation allows us to speak of God in the terms He has set for Himself—in the identity of Jesus the Christ. Preaching is itself incarnational. In the preaching event a human being stands before a congregation of fellow humans to speak the most audacious words ever encountered or uttered by the human species: God has made Himself known in His Son, through whom He has also made provision for our salvation. As Karl Barth insisted, all preaching must have a thrust. The thrust cannot come from the energy, earnestness, or even the conviction of the preacher. “The sermon,” asserted Barth, “takes its thrust when it begins: The Word became flesh … once and for all, and when account of this is taken in every thought” (Karl Barth, Homiletics, tr. Geoffrey Bromiley and Donald W. Daniels. Louisville: Westminster/John Knox Press, 1991, 52). The power of the sermon does not lie in the domain of the preacher, but in the providence of God. Preaching does not demonstrate the power of the human instrument, but of the biblical message of God’s words and deeds. Jesus serves as our model, as well as the content of our preaching. As Mark recorded in his Gospel, “Jesus came preaching” (1:14), and His model of preaching as the unflinching forth-telling of God’s gracious salvation is the ultimate standard by which all human preaching is to be judged. Jesus Himself sent His disciples out to preach repentance (Mark 6:12). The church received its charge to “preach the good news to all creation” (Mark 16:15). Preaching is, as Christ made clear, an extension of His own will and work. The church preaches because it has been commanded to do so. If preaching takes its ground and derives its power from God’s revelation in the Son, then the cross looms as the paramount symbol and event of Christian proclamation. “We preach not ourselves,” pressed Paul, “but Jesus Christ as Lord” (2 Cor. 4:5). That message was centered on the cross as the definitive criterion of preaching. Paul understood that the cross is simultaneously the most divisive and the most unifying event in human history. The preaching of the cross—the proclamation of the substitutionary atonement wrought by the sinless Son of God—“is foolishness to those who are perishing, but to those of us who are being saved, it is the power of God” (1 Cor. 1:18). Beyond this, Paul indicated the danger of ideological temptations and the allure of “technique” as threats to the preaching of the gospel. Writing to the church at Corinth, Paul explained: “My message and my preaching were not with wise and persuasive words, but with a demonstration of the Spirit’s power, so that your faith might not rest on men’s wisdom, but on God’s power” (1 Cor. 2:4–5, NIV). To preach the gospel of the Son who saves is to forfeit all claim or aim to make communication technique or human persuasion the measure of homiletical effectiveness. Preaching is effective when it is faithful. The effect is in the hands of God. The preacher dares to speak for God, on the basis of what God has spoken concerning Himself and His ways, and that means speaking the word of the cross. That underscores the humility of preaching. As John Piper suggests, the act of preaching is “both a past event of substitution and a present event of execution” (John Piper, The Supremacy of Christ in Preaching. Grand Rapids: Baker Book House, 1990, 35). Only the redeemed, those who know the cross as the power and wisdom of God, understand the glory and the burden of preaching. To the world of unbelief, such words are senseless prattle. To preach the message of the Son who saves is to spread the world’s most hopeful message. All Christian preaching is resurrection preaching. A theology of preaching includes both a “theology of the cross” and a “theology of glory.” The glory is not the possession of the church, much less the preacher, but of God Himself. The cross brings the eclipse of all human pretensions and enlightenment, but the empty tomb reveals the radiant sunrise of God’s personal glory. If Christ has not been raised, asserted Paul, “our preaching is useless” (1 Cor. 15:14, NIV). This glimpse of God’s glory does not afford the church or the preacher a sense of triumphalism or self-sufficiency. To the contrary, it points to the sufficiency of God and to the glory only He enjoys—a glory He has shared with us in the person and work of Jesus Christ. The reflection of that revelation is the radiance and glory of preaching. The preacher stands before the congregation as the external minister of the Word, but the Holy Spirit works as the internal minister of that same Word. A theology of preaching must take the role of the Spirit into full view, for without an understanding of the work of the Spirit, the task of preaching is robbed of its balance and power. The neglect of the work of the Spirit is one evidence of the decline of biblical trinitarianism in our midst. Charles H. Spurgeon warned, “You might as well expect to raise the dead by whispering in their ears, as hope to save souls by preaching to them, if it were not for the agency of the Holy Spirit” (Charles H. Spurgeon, New Park Street Pulpit, 5.211). The Spirit performs His work of inspiration, indwelling, regeneration, and sanctification as the inner minister of the Word; it is the Spirit’s ministry of illumination that allows the Word of the Lord to break forth. Both the preacher and the hearers are dependent upon the illumination granted by the Holy Spirit for any understanding of the text. As Calvin warned, “No one should now hesitate to confess that he is able to understand God’s mysteries only in so far as he is illumined by God’s grace. He who attributes any more understanding to himself is all the more blind because he does not recognize his own blindness” (Calvin, Institutes, II.2.21, 281). This has been the confession of great preachers from the first century to the present, and it will ever remain. Tertullian, for example, called the Spirit his “Vicar” who ministered the Word to himself and his congregation. The Reformation saw a new acknowledgement of the union of Word and Spirit. This testimonium was understood to be the crucial means by which the Spirit imparted understanding. This trinitarian doctrine produced preaching that was both bold and humble; bold in its content but uttered forth by humble humans who knew their utter dependence upon God. Seek Him always. But go beyond seeking Him; expect Him. Do you expect anything to happen when you get up to preach in a pulpit? Or do you just say to yourself, “Well, I have prepared my address, I am going to give them this address; some of them will appreciate it and some will not”? Are you expecting it to be the turning point in someone’s life? That is what preaching is meant to do … Seek this power, expect this power, yearn for this power; and when the power comes, yield to Him (Martyn Lloyd-Jones, Preaching and Preachers. Grand Rapids: Zondervan, 1971, 325). To preach “in the Spirit” is to preach with the acknowledgement that the human instrument has no control over the message—and no control over the Word as it is set loose within the congregation. The Spirit, as John declared, testifies, “because the Spirit is the truth” (1 John 5:6b, NIV). J. I. Packer defined preaching as “the event of God bringing to an audience a Bible-based, Christ-related, life-impacting message of instruction and direction from Himself through the words of a spokesperson” (J. I. Packer, “Authority in Preaching,” The Gospel in the Modern World, ed. Martyn Eden and David F. Wells. London: InterVarsity Press). That rather comprehensive definition depicts the process of God speaking forth His Word, using human instruments to proclaim His message, and then calling men and women unto Himself. A theological analysis reveals that preaching is deadly business. As Spurgeon confirmed, “Life, death, hell, and worlds unknown may hang on the preaching and hearing of a sermon” (Charles H. Spurgeon, Metropolitan Tabernacle Pulpit 39. London: Alabaster and Passmore, 1862–1917: 170). The apostle Paul revealed the logic of preaching when he asked, “How, then, can they call upon the one they have not believed in? And how can they believe in the one of whom they have not heard? And how can they hear without someone preaching to them?” (Rom. 10:14, NIV). The preacher is a commissioned agent whose task is to speak because God has spoken, because the preacher has been entrusted with the telling of the gospel of the Son who saves, and because God has promised the power of the Spirit as the seal and efficacy of the preacher’s calling. The ground of preaching is none other than the revelation which God has addressed to us in Scripture. The goal of preaching is no more and no less than faithfulness to this calling. The glory of preaching is that God has promised to use preachers and preaching to accomplish His purpose and bring glory unto Himself. Therefore, a theology of preaching is essentially doxology. The ultimate purpose of the sermon is to glorify God and to reveal a glimpse of His glory to His creation. This is the sum and substance of the preaching task. That God would choose such a means to express His own glory is beyond our understanding; it is rooted in the mystery of the will and wisdom of God. Yet, God has called out preachers and commanded them to preach. Preaching is not an act the church is called to defend but a ministry preachers are called to perform. Thus, whatever the season, the imperative stands: Preach the Word! About the Author: R. Albert Mohler Jr. (PhD, Southern Baptist Theological Seminary) serves as the ninth president of Southern Seminary and as the Joseph Emerson Brown Professor of Christian Theology. Considered a leader among American evangelicals by Time and Christianity Today magazines, Dr. Mohler hosts a daily radio program for the Salem Radio Network and also writes a popular daily commentary on moral, cultural, and theological issues. Both can be accessed at http://www.albertmohler.com. 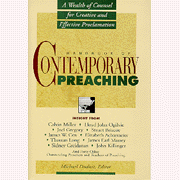 The Article above was adapted from the Handbook of Contemporary Preaching (Chapter One, pp. 13-20) edited by Michael Duduit. Nashville, TN: Broadman and Holman Press, 1992. Dr. Mohler is the author of several excellent books including: He is Not Silent: Preaching in a Postmodern World; Culture Shift: The Battle for the Moral Heart of America; Words From the Fire: Hearing the Voice of God in the 10 Commandments; and The Disappearance of God: Dangerous Beliefs in the New Spiritual Openness.